Gateway Lite BT enables music playback from a USB storage iPod/iPhone some Androids through your Audi’s factory car stereo, use the buttons of the car stereo for basic control or steering wheel controls. This device also offers Bluetooth connectivity for music streaming (via A2DP) and hands free mobile call handling via the original buttons of the Audi Radio. 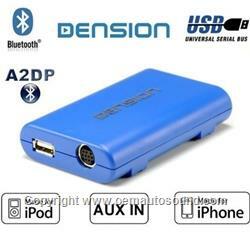 Simple, seamless iPod, iPhone, Smartphone and USB device car integration. Bluetooth hands free to the oem Audi radio. File System: FAT16 or FAT32. Storage capacity: up to 250GB music content. Music Format: MP3, WMA and WAV. Use your iPod/iPhone or Smart Phone with your Audi stereo! The Gateway Lite BT adapter brings you maximum control of your iPod. This interface opens up the Audi original audio system to allow music playback through your factory installed entertainment system’s speakers. Hide your iPod or USB drive in the glove box and you can control its functions using the controls on your radio.